Here are a few things I thought might be helpful to new climbers and some good reminders for experienced climbers. This is just a guide, for official rules check out the USA Climbing rulebook. Also, please add your own additional tips in the comments section. I tried not to use too much climbing jargon. Check out the climbing term glossary on Wikipedia if you are unfamiliar with some terms. Most of the local comps a run in “redpoint format." There are usually about 50 problems/routes that vary in difficulty. Harder problems have a higher point value. Points are scored by sending (completing) the problem from the start to the top without falling or weighting the rope and by only using holds that are on the designated route. 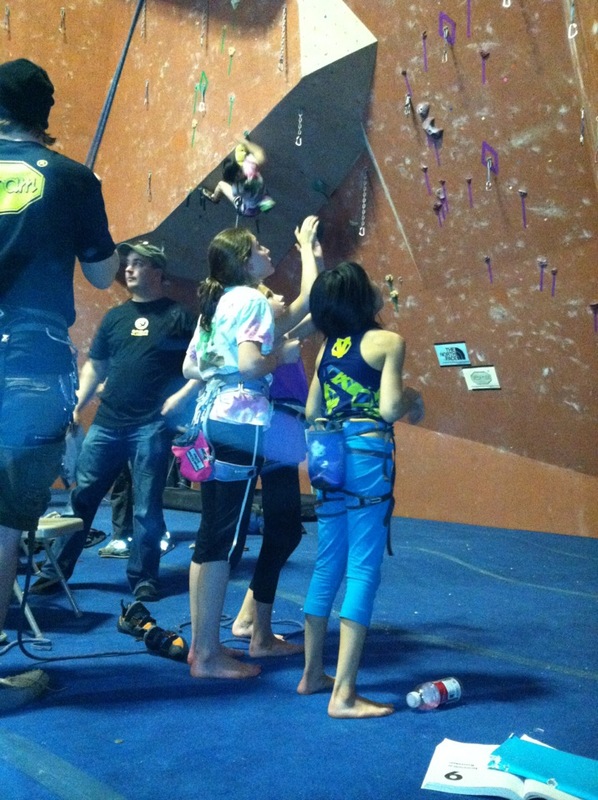 Competitors must complete problems without getting verbal or visual help while on the wall (beta). Partial points are not awarded in redpoint format. At the end of the predetermined time period, which is usually about three hours, the points are added for the top four or five problems sent. Some comps deduct some points for falls and some give a bonus for flashes (a send on the first attempt). Championship comps like regionals, divisionals and nationals are typically run in an onsite or flash format. Pre-register either online or call the gym a few days before. This saves time the morning of the comp and reserves your entry in case it sells out. You may save a few bucks for pre-registration or score some swag as well. If you're interested in competing at championships, make sure your USAClimbing membership is up to date and include your membership number on the registration form. Gather your gear together to reduce chances of forgetting something. Generally all you need shoes, chalk bag, water bottle and a harness for rope season. Most gyms sell gear during comps so if you realize you are low on chalk, don’t worry. Pack some snacks. Some gyms sell food, some don’t. Get a good night’s rest. Comps can be both physically, mentally and emotionally demanding. A well-rested competitor will always perform better. Plan to get to the gym about an hour before the start. This gives time extra time for the unexpect traffic/construction/road closures etc. Register and pick up your scorecard. Double check that your USA Climbing number is correct. Socialize with teammates, coaches and other competitors. Preview the routes/problems. During your preview time, try to find a few routes/problems that are good for warming up on, a few that are near your flash limit and a few that may take no more than three tries to send. Talk to coaches and teammates to get some beta. Warm up in the warm-up area, not on the judged routes/problems. Once things begin, give your scorecard to the judge in front of a problem you would like to try. While you are waiting, watch other climbers try problems. They may reveal how to do a move or how not to do a move. When it’s your turn, the judge will call your name. Tell the judge which problem you will attempt. Take a moment to review and sequence the problem. Ask the judge any questions you may have about the problem. If you are unsure if a hold, feature or arete is “on” or “off," ask the judge before you get on the wall. Chalk-up, take a few deep breaths and begin climbing. If you slip on the first move, most judges will give you a do over. When you get to the top, match both hands on the finish, and make clear eye contact with the judge and confirm that the judge sees you matching the final hold. Don’t let go of the match until the judge gives you a thumbs up or verbal ok.
Move on to your next problem. Near the end of the allotted time period, an announcement will be made that there are X minutes left. Make sure to turn in your scorecard at the end of the comp! Complete five (5) easy problems in the first hour to fill up your score card. Now you can relax and work on harder problems without worrying about wasting time. This helps relieve some of the pressure and stress you may feel during the competition. Stay hydrated and eat during the competition. Try to drink and snack continually; don’t wait until you are thirsty or hungry. You are burning a lot of energy and keeping fueled allows you to perform consistently both physically and mentally. Food and water also help keep you in check emotionally and allow you to focus more clearly. Bagels, bananas, cliff bars, etc. are good energy sources. Look for problems that play to your strengths. Look at the terrain (steeps, slab, dihedral) and dominant hold type (pinches, crimps, slopers). Use the scorecard as a guide to look for problems to try. You should be able to send most problems within a close range of point values. Remember that points don’t necessarily correspond to V-grade or YDS (5.x) grades. Talk to teammates and coaches to see what problems other climbers near your ability level are sending and to trade beta (tips for getting through difficult moves). Watch other competitors attempt problems before you do. There’s no bonus for being the first one to send a problem so don't waste time being the guinea pig. Sequence every problem before you start, thinking about your foot placement as well as hands. This increases your chance of sending and you will climb more efficiently, saving energy for future problems. Try hard but don’t get frustrated. If you can’t send a problem after about three(3) tries, move on to another one. Save your energy for problems you are more likely to send. You can always come back to harder problems toward the end of the time limit. Look for “easter egg” problems. Sometimes the route setters overscore an easy problem by 100 points or more. If a problem looks doable for you, try it even if it is scored significantly higher above other problems you have sent. During longer comps, leave the gym for a while, get some fresh air, sunshine and some food. Come back rested and refreshed, ready to send. You usually have 3–4 hours to do five problems, which is plenty of time. No need to rush! Cheer for your teammates and competitors. A few words of encouragement during a crux move can get someone through. They will likely return the favor. Be a good sport. This isn't hockey. Most of all, have fun. That's why you started climbing, right? Enjoy some new problems and being with other people that love this sport as much as you.